Ever since the gods of Ancient Egypt were unleashed on the modern world, Carter Kane and his sister, Sadie, have been in big trouble. As descendants of the magical House of Life, they command certain powers. But now a terrifying enemy - Apophis, the giant snake of chaos - is rising. If Carter and Sadie don't destroy him, the world will end in five days' time. And in order to battle the forces of chaos, they must revive the sun god Ra - a feat no magician has ever achieved. Because first they must search the world for the three sections of the Book of Ra, then they have to learn how to chant its spells ...Can the Kanes destroy Apophis before he swallows the sun and plunges the earth into darkness ...forever? 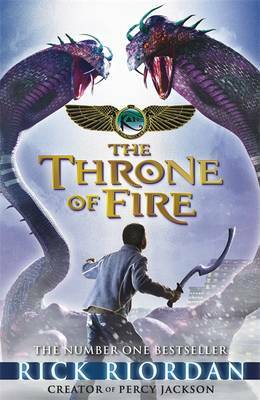 Rick Riordan hasn’t failed to impress me with the Second of the Kane Chronicles ‘The Throne of Fire’. If anything it’s wowed me more and proved to be better than the first in the series. I suppose in this Novel Carter and Sadie have come to terms with their magic only making it more action packed, magic packed and a totally awesome thriller. So like I said this book focuses in on the fact that Sadie and Carter have come to terms with: their powers, the fact that Apophis is rising, that yet again they have to save the world and Yet again they have many enemies including the house of life. The book is a unique and since the first book in the series was released many other Egyptian mythological books have hit the shelves but none of them live up to Riordan: Myth Master. There weren’t any negatives about this book. I had been waiting for this book since reading book one and meeting Riordan last year, and book 2 didn’t let me down. I got it about two days before release and whizzed through it. The reason it’s taken this long to write a review, and the reason the review is so short is because it has truly left me speechless. I just can’t put into words how much I love it. I mean I’m a sucker for fantasy but this takes it to a whole new level. I haven’t read anything like it before or experienced any of the creatures. In this book we are introduced to many new characters such as the Brooklyn house crew and Jazz, who was one of my favourite minor characters. She is the so to speak ‘Queen Bee’ but she isn’t mean of vain but really nice. I thought my favourite character was Sadie, and in the first book it was, but in this book I kept on being really drawn to Carter and I don’t know why! Another new character was Bes, the dwarf god, who I really loved. He was witty, funny (can’t emphasize on that enough), ugly (especially in Speedos), in a love triangle, and most definitely short! But he was funny, so I was like... Ok it’s decided, I like him. This is a fun, exiting, new, action packed novel full to the brim with magic, adventure, and three, two and one headed snakes (along with an awfully large one trying to eat the sun) What more can I say? Oh yeah... AMAZING! Great review! I loved Riordan's series Percy Jackson and The Lost Hero, but I can't say I was a fan of The Red Pyramid. Great to hear that this is better than the first; maybe I will pick it up! This book, like the last is told from the points of view of dual protagonists: Carter Kane and Sadie Kane. For kids, this may be a bit daunting, as the switch back and forth involves two distinctly drawn characters with different voices. I like it, because my son, who normally shies away from books with female protagonists, is absolutely willing to read this. I think I love anything Rick Riordan. The guy has an incredible flare for writing :) So funny too!